Sally and I just completed a 4-week, 7,000 mile driving trip of the western part of US. 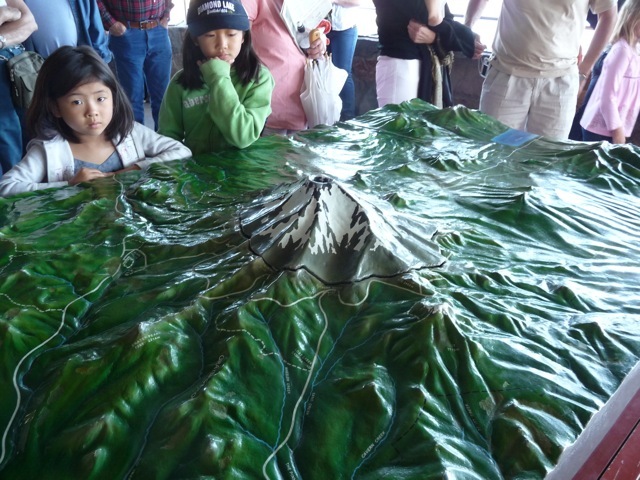 Of the many sights we saw, I was very impressed by the three volcanoes we visited. Mt. 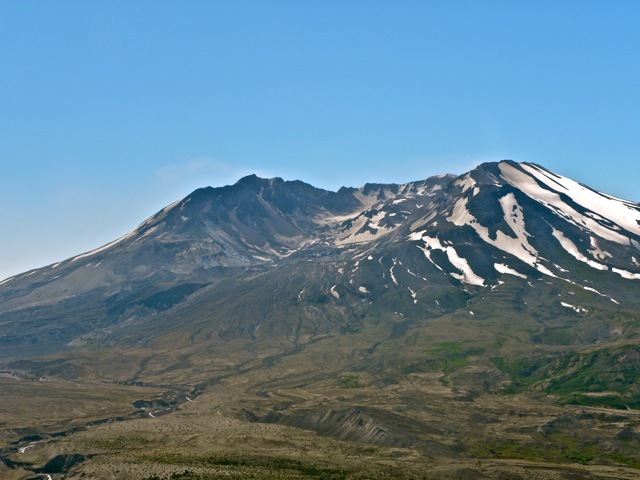 St. Helens erupted in 1980, merely 31 years ago. The molten magma underground swelled and pushed the mountain up in a dome. When the dome became too big, it slid down the mountainside, releasing the high pressure in an explosion. 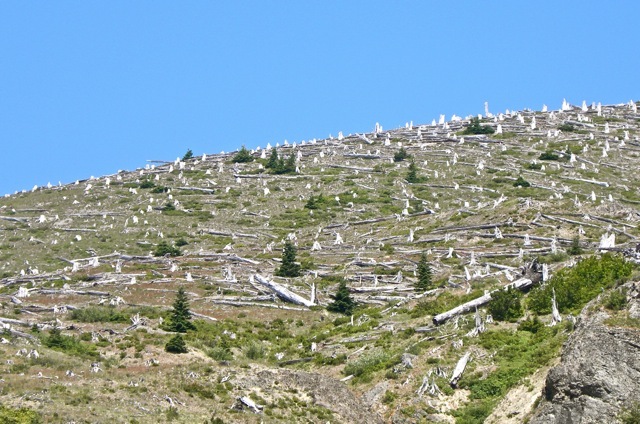 It was the biggest landslide witnessed by recorded history, and the subsequent explosion knocked down all trees within six miles. 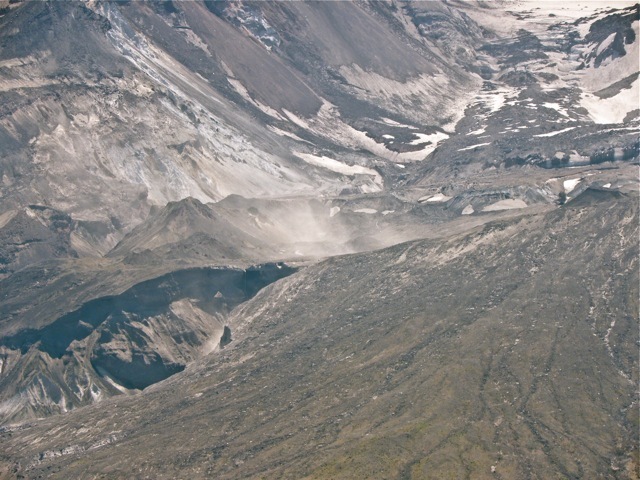 The eruption left a crater 2 miles long on one side of the mountain. The crater as seen today. 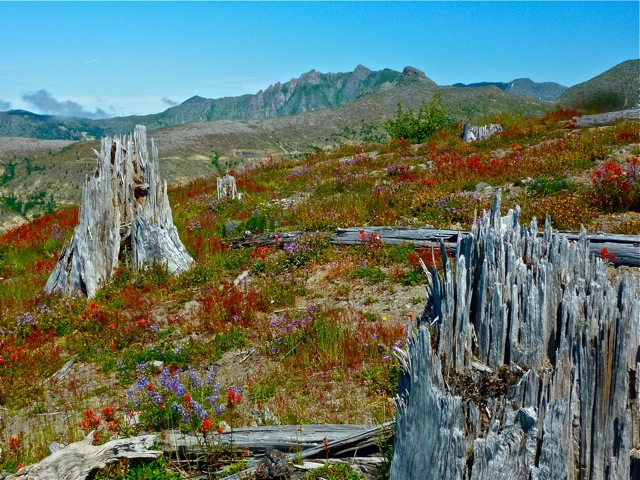 The land is allowed to evolve naturally for scientists to observe how devastated land rejuvenates itself. Volcanic ash have been cut into ravines by rain and snow runoffs, and trees are beginning to grow on the land. The volcano continues to be active. 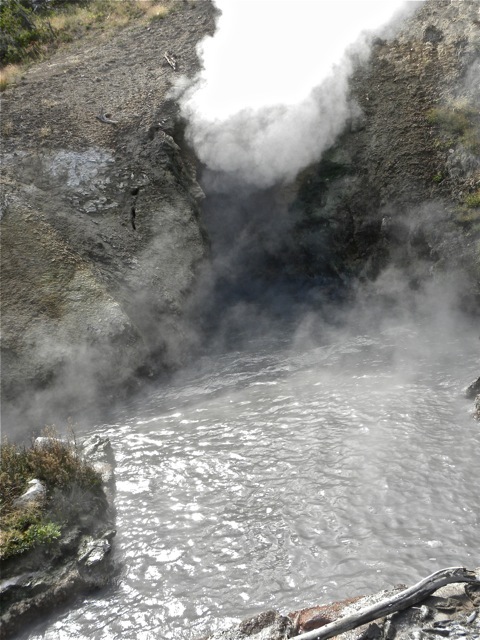 Steam rises from vents in the caldera. Trees blown down 31 years ago lie as they fell, and young saplings are growing among the dead wood. We were happily surprised to find the ground covered in multicolored flowers. Snow melted earlier, and ground cover plants bloomed. A mountain used to exist but was blown off in a volcanic eruption 400,000 years ago. 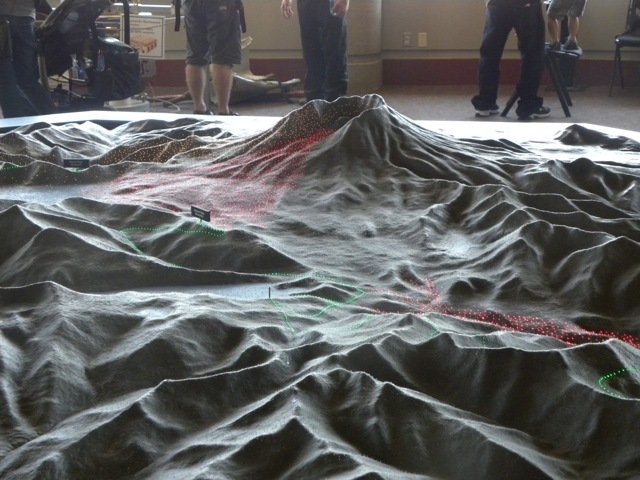 The massive eruption blew the top of the mountain away along with the molten magma under it. 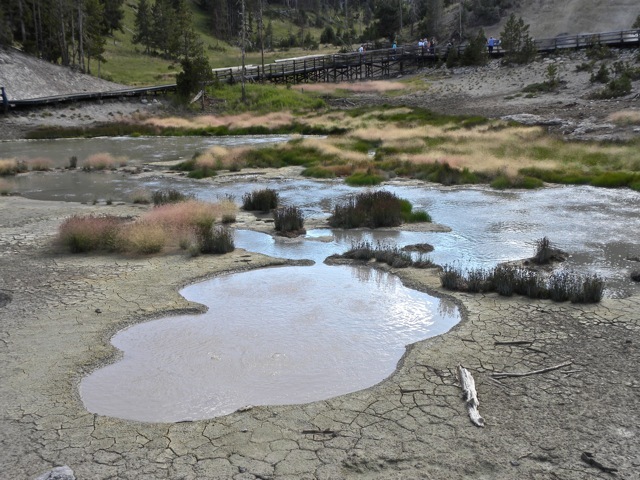 The remaining deep hole was later filled with rain and snow water, forming the Crater Lake. 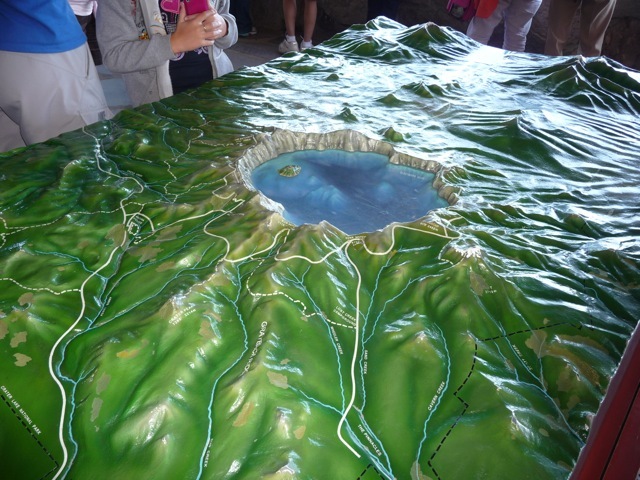 Crater Lake has a diameter of about 6 miles. 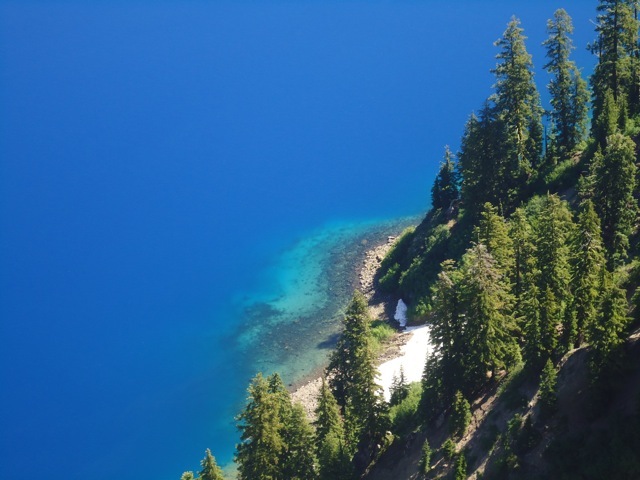 It is the deepest lake in the US at 2,000 feet. As the water is not fed by any organism-laden river, it is extremely clear with an exceptionally clear visibility of 140 feet. When the volcano erupted, expanding gas inside molten lava formed spongy rocks. 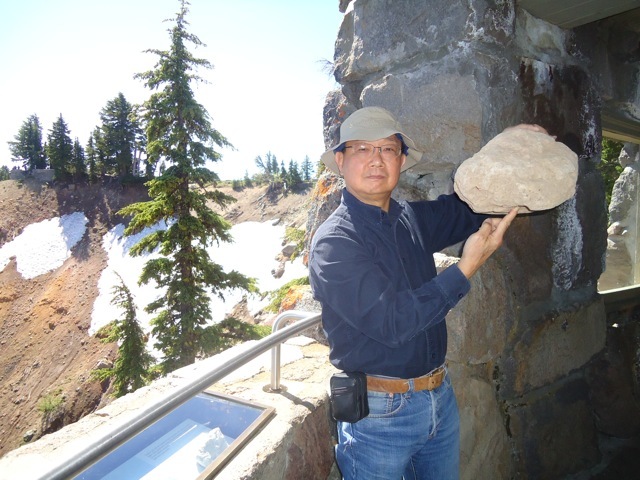 This big piece of volcanic rock weighted only a few pounds and I could easily support it with one finger. A subsequent eruption formed a cinder cone that is named Wizard Island. The lake is surrounded by a rim of steep sided wall. The lake water is clean with a deep blue color due to its great depth. Heavy snow covers the mountain and roads in the winter. 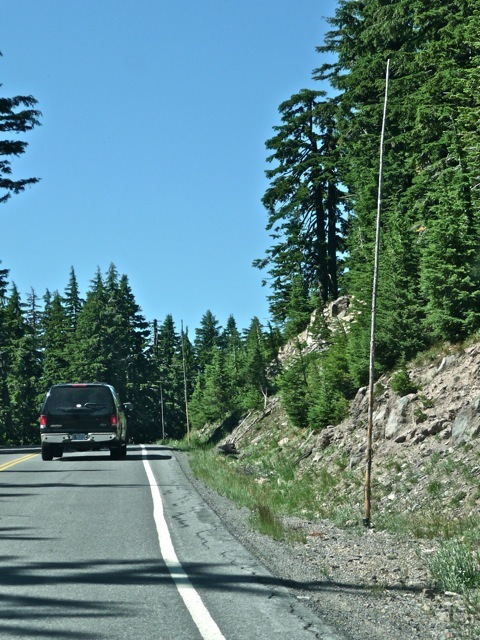 Tall rods line the road to indicate where the road is under a dozen feet of snow. 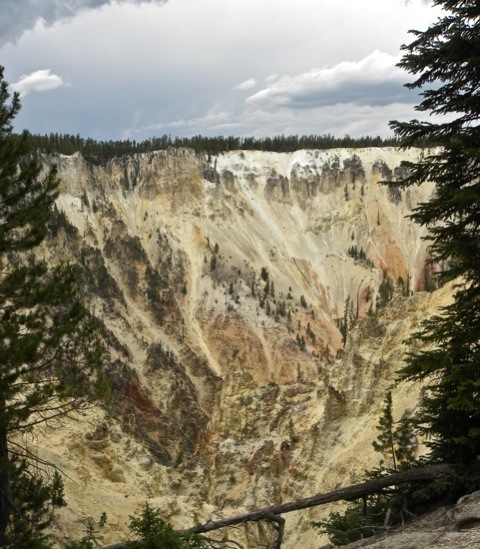 Yellowstone National Park is one of a dozen super-volcanoes of the world. 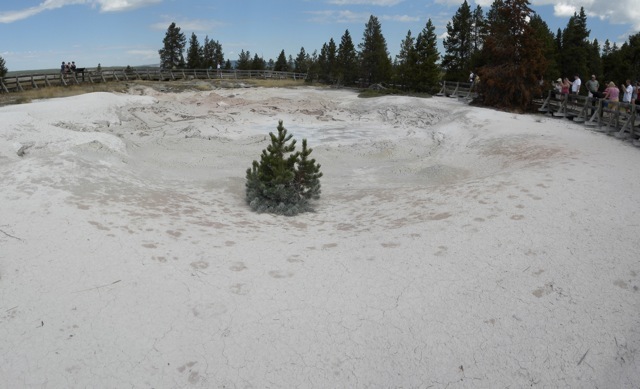 It last erupted 600,000 years ago and left a caldera 40 miles in diameter. When it erupted, a whole continent was devastated. Yellowstone sits on a “hot spot” where the Earth’s crust is thin and molten magma is close to the surface. Since at least 15 million years ago, it has periodically erupted and formed big calderas. 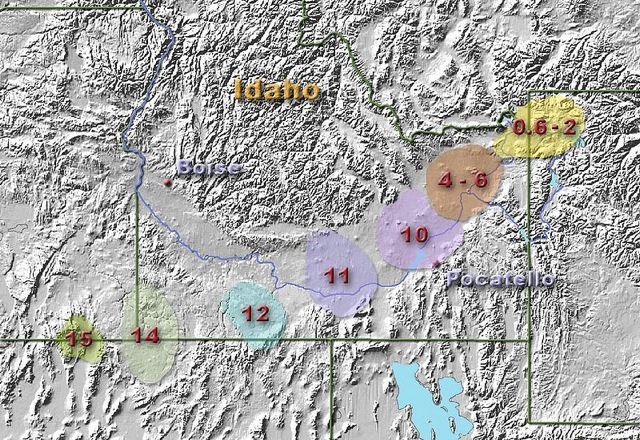 As the North American tectonic plate moved southwest-ward, those older calderas were carried southwest-ward, forming a gulch of low land amidst surrounding mountains. Yellowstone will erupt again, and it is anybody’s guess when that will happen. This vent blows steam and hot water with loud gurgling sounds. It is appropriately named Puff the Magic Dragon. 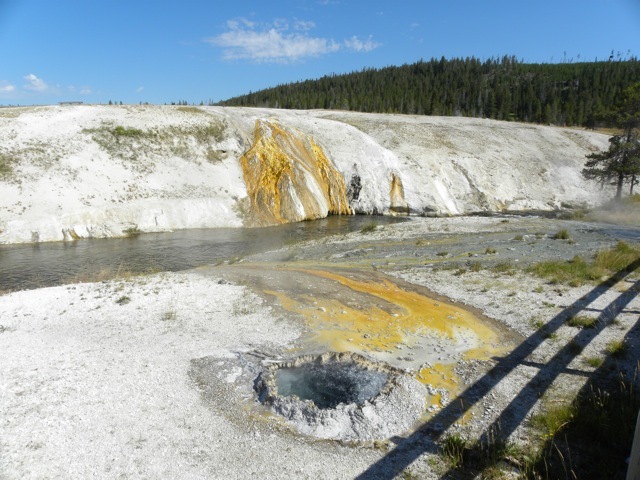 Hot springs bring sulfur and other mineral to the surface, covering the ground with yellow color which gave the name to this place. Pond surface ripple with air bubbles rising from the bottom. Beautifully colored grasses grow by these ponds. This giant white bowl was formed by a mud pot that gurgles mud. Curiously, a tough pine tree thrives and grows in it. It is a cool refreshing Christmas scene when the temperature is in the 90s. 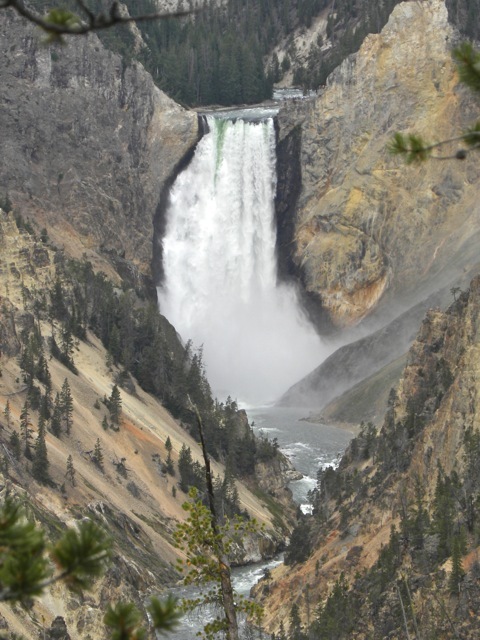 The Yellowstone River Falls rumbles spectacularly. The river cuts a steep walled canyon. The canyon exposes the yellow sulfur, the red iron oxide, and many other minerals that paints the canyon into a colorful pallet. 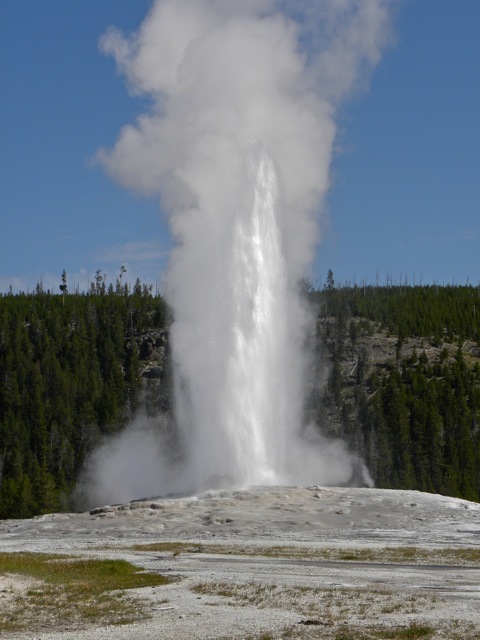 True to its name, the Old Faithful geyser erupts once every 90 minutes. 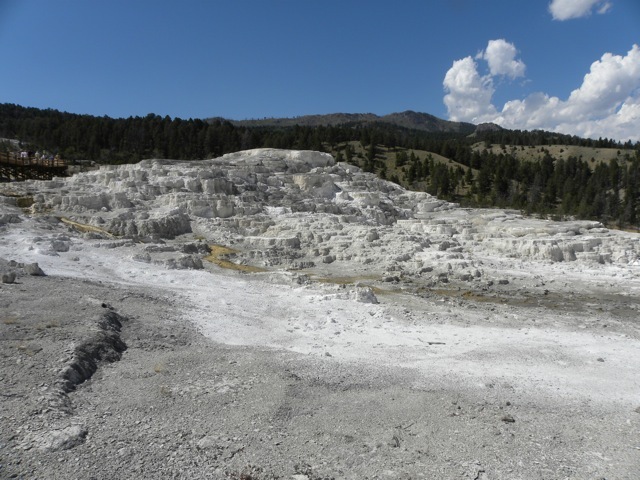 Due to decreased water flow, the terraced pools formed by minerals of the cascading ground water is no more. All that remains today is a tiny stream and eroded skeletons of the colorful terraced pools. As this was the last scene of our visit to this national park, we left somewhat disappointed. Posted by Robert Wu on Friday, September 9, 2011, at 3:59 pm. Filed under Uncategorized. Follow any responses to this post with its comments RSS feed. You can post a comment or trackback from your blog.